THE SIXT GENERATION: THE GLOBAL COFFEE. 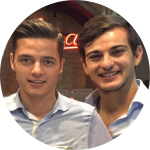 Elio and Enrico Jr. are responsible for national and international expansion of the brand, focusing on identifying and developing new markets and business opportunities. They are in charge for web and social media marketing as well as coordinating the products restyling of the family’s brand according to Barbera’s values. Barbera Coffee Company bought the trademark Tris Coffee to corner the national market and gain a bigger market share. In 2002 he created a Menu with eighteen coffee recipes. 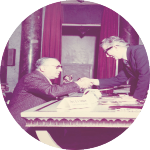 In 2003 Caffe Barbera opened coffee branches introducing them in Italy and worldwide. 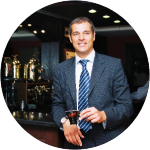 During these years, Barbera Coffee developed internationally by expanding its business all over the world. Today Barbera Coffee distributes its products throughout Italy and in more than 55 countries, over 5 continents. In 1978 Barbera Coffee became a Co. The Barbera’s family has won several awards for their coffee’s high quality, although its best and most valuable acknowledgement comes from its worldwide customers who choose Barbera Coffee every day. The 1953 represented the handicraft production and industrial joint, followed by a new management approach: from quality audit to upgraded machinery to new line products. 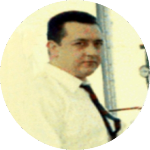 Carmelo Barbera, specialized in Food Technology from Columbia University (NY), created the first chemical laboratory in order to improve manufacturing procedures. A simple intuition? Yes. Did it make any difference? Of course, it did. Barbera Coffeeappears in specialized international magazines and newspaper articles. It’s Antonio’s turn to move on, supported by his son Letterio Barbera, and open another Barbera Coffee branch in Naples, the historical and traditional home of coffee (both the famous bar “Caffè Letterario Liberty” and the popular ritual “caffè sospeso”, a paid in advance cup of coffee, are good examples of how coffee is a deep-rooted drink in Naples). Along many highlighted risks have followed satisfactions and success through the decades. Four years later, Letterio opened a warehouse in Milan and created a big network throughout all Italy: the famous Barbera Coffee started being known and enjoyed everywhere. 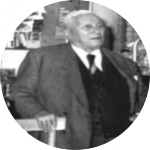 Antonio Barbera, one of Domenico’s sons, continued to take care of the family business: quality, asset management and brand imaging made the Barbera Coffee one of the most widely enjoyed drinks of Southern Italy between World Wars One and Two. Neither the war devastation stopped them from reaching their dreams. 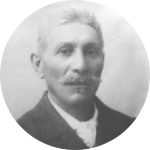 The story of Barbera Coffee begins back in 1870 when Mr. Domenico Barbera settled in Southern of Italy and started roasting coffee with a small handcrafted roasting machine. Also known as the Coffee Magician, Mr. Barbera started doing business with his typical meticulous Northern Italian approach and then later, his adopted cross -cultural Mediterranean traits. His first roasting machine, called Tornado, was capable of toasting 30 Kilos of coffee at the time. The Tornado symbolized Mr. Barbera’s pride and joy. Even though he unexpectedly passed away at young age, he handed down his knowledge and passion to his children and it lives today in the family business that bears his name.